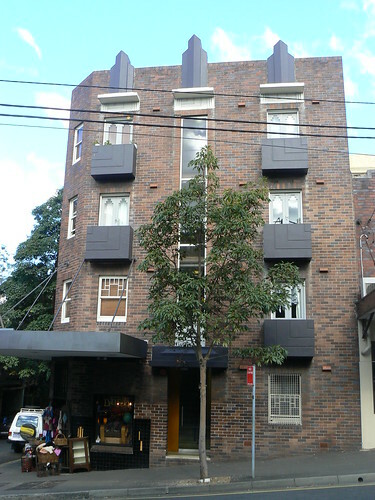 I like the shape of the decoration on the roofline of The Rutland, an apartment block in Sydney's Darlingurst area. I also like the incised lines on the balconies but why are they such a dull colour? It looks VERY Sydney and impressive, doesn't it? No way that block of flats could have been in Melbourne or Adelaide. The deco elements are still lovely even now, but I wonder if the dark grey was the original colour. I don't know but I don't think the dark grey is original but you never know.